I've added real-time reprojection cache to the engine. For SSAO looks like a winner technique because it uses expensive shader. Red pixels aren't re-computed because they are stored in an auxiliar buffer to be reprojected. Thanks, I've been seen that. 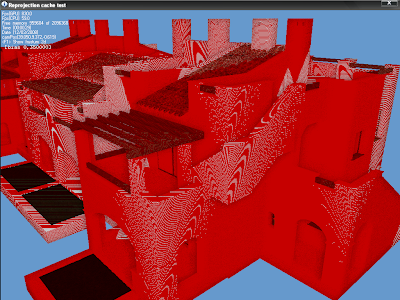 But I use the re-projection cache only in order to avoid duplicate pixel shader calculations between frames. Anyway... It's a nice technique. How does someone become a Muslim?"